As shadowy dream-invading creatures unleash a new power, dragons disappear from a mystical, art-created world. 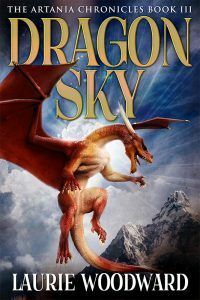 Soon after, Alex, Bartholomew and Gwen enter this magical place on a quest to return the elusive golden dragons to the sky. Laurie Woodward is an educator and the author of Forest Secrets and the fantasy series: The Artania Chronicles. The Pharaohs’ Cry, Kidnapped Smile, and Dragon Sky are available on amazon.com and Laurie is also a collaborator on the award-winning anti-bullying DVD Resolutions. She was cowriter of Dean and JoJo: The Dolphin Legacy. Ms. Woodward is an award-winning peace consultant who helps teach children how to stop bullying, avoid arguments, and maintain healthy friendships. Laurie writes her novels on the Central Coast towns of California.